Children will delight in the further adventures of Dorothy and her friends as they revisit Oz. Frank Baum was a famous author of children's books. 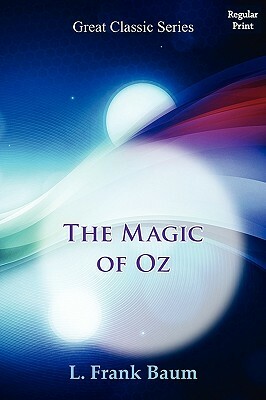 He is best noted for his book The Wizard of Oz. Baum used several pen names when writing different series. The Magic of Oz is a faithful record of the remarkable adventures of Dorothy and Trot and the Wizard of Oz, together with the Cowardly Lion, the Hungry Tiger and Cap'n Bill, in their successful search for a magical and beautiful birthday present for Princess Ozma of Oz. Princess Ozma decrees that only Glinda the Good and the Wizard of Oz may practice magic in the Land of Oz, but trouble comes to the Emerald City with old Ruggedo, the ex-Nome king, and Kiki Aru, the clever Hyup sorcerer, who know the secret of changing people into animals. This is the sequel to "The Tin Woodman of Oz."